Is university free speech under threat? Students at the London School of Economics set up a Free Speech Society in January in response to what they say is increasing censorship on university campuses. Now students are voting on whether the society should be banned. What's behind the row? Universities have long been considered places for debate and for ideas to be challenged, but alongside that they are also meant to be places where minorities of all kinds can feel safe, comfortable and not sidelined in a way they may be elsewhere. These two ideals are currently causing conflict on campuses, fuelled by concepts such as "safe space" and "no platforming" - used by students with a view to gathering and having discussions without views or opinions that are deemed offensive or threatening. So how can these terms best be defined? 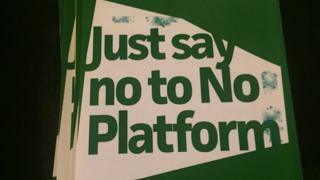 ·No platform asserts that no proscribed person or organisation should be given a platform to speak, nor should a union officer share a platform with them. ·A safe space is an accessible environment in which every student feels comfortable, safe, and can get involved free from intimidation or judgment. The National Union of Students (NUS) has an official no platform list which includes the BNP and Al-Muhajiroun, but individual unions and student groups can decide their own. Some recent decisions have caused a stir. Feminist writer Julie Bindel was banned from speaking at Manchester University's student union last October as they said her views on transgender people could "incite hatred towards and exclusion of our trans students". And at Canterbury Christ Church University, an NUS rep refused to share a platform with gay rights activist Peter Tatchell, whom she regarded as having been racist and "transphobic". This decision and others are still being rowed about online - free speech advocates calling "censorship", but others arguing safe spaces allow free speech for those shut down throughout history. Brendan O'Neill is one of those who think this all amounts to censorship - the editor of current affairs magazine Spiked Online held a conference last week on the issue. He first campaigned against no platform while at university two decades ago - then it was only used against racists and Zionists. "We argued that if you censored these groups, there's nothing to stop the censorious logic from spreading and encapsulating more and more people - and that's exactly what happened. "When you accept the idea that some thoughts are too dangerous to have in public life, there's nothing to stop other thoughts from being swallowed up." But NUS president Megan Dunn said: "It's simply not the case that they are banned or censored, it's just whether they are invited to a students' union to speak or not. This is about students' unions, they're democratic organisations." The Free Speech Society was started at LSE in January in reaction to incidents including the suspension of the rugby team for handing out sexist leaflets. On Friday, in what they describe as an ironic move, students are voting on whether the society should be banned. Its head, Charlie Parker, believes freedom of expression is being stifled. "Free speech has always been there to help and protect minorities - if you look at gay rights movements, civil rights movements, feminism, all the great progression under these movements was made possible through the use of freedom of expression," he said. But many students argue that safe spaces are in place to make sure all students have a voice. Rayhan Uddin, Labour Society black and minority ethnic officer at LSE says safe spaces are useful in certain circumstances to allow repressed voices to speak. "Clearly we have some problems when it comes to structural barriers for certain groups. And if women and ethnic minority students on campuses want to self-organise to help overcome some of the barriers they face, I would say all power to them," he said. The National Union of Students said it has to listen to students when they say they find others' views threatening. "There have certainly been moments in my education when I have been uncomfortable, my views have been challenged - I think most of us will be able to draw a distinction between times we have been uncomfortable and times we have felt threatened," Ms Dunn said. "Some people would say opinions are threatening to them, and we have to be able to listen to that view as well." The debate continues but the one thing that everyone I spoke to agreed on is that they want everyone to have a voice at university - they just disagreed about how best to achieve that. The Victoria Derbyshire programme is broadcast on weekdays between 09:15 and 11:00 on BBC Two and the BBC News channel.